Building upon the new vibe of the Mars-Saturn conjunction in Libra is a character test, symbolized by the Sun in Leo’s square and Venus in Virgo’s semi-square to Pallas in Scorpio, that stresses the middle way as the strategy to be employed in all our interactions. It’s not a day to put the Self front and center with this accentuated emphasis on sharing and joint ventures. Instead, take yourself back a bit, use a moderate approach and focus on cooperation and comprise. Tarot card of the day is the “King of Pentacles”, presenting an individual who combines knowledge and practicality to achieve his objectives. He is a builder and manager, a person who has achieved success through practical effort. Material wealth is important, yet he is caring and a good friend. Happiness for him is a comfortable lifestyle and possessions. He finds opportunity everywhere, using his intelligence and skill, and is patient enough to work conscientiously toward his goals. Dependable and responsible, once he makes a commitment he will not let people down. His innate conservatism means that he generally prefers traditional surroundings and well-made things, for he knows these have stood the test of time. He can be possessive of both friends and lovers, but must be balanced against his depth of feeling and need for security. 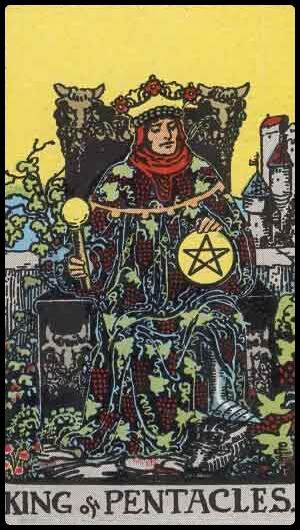 This King embodies all the qualities of the earth element (Pentacles). Especially with the Sun in Leo in a challenging aspect, a tendency toward control and an overbearing, stubborn attitude could prevail. However, the King is a mature person, well grounded and can rely on his patience and pragmatism. The castle in the background of the image indicates the strength of character he has acquired and upon which his reputation is build. His personality is a reflection of how he handles the bull. Thus, the message is ‘leadership through discipline (or Self-control). Mercury in Virgo casts a trine to Pluto Rx in Capricorn and a quincunx to Jupiter Rx in Aries, indicating that our ability to organize and structure our thoughts has improved, leading to a better understanding of issues, which are complex and far-reaching. As Mars is perfecting a conjunction with Saturn in Libra, while at the same time opposing Uranus Rx in Aries, a new cycle of controlled, disciplined Self-assertion is about to begin that is at the same time a reorientation aimed at individual and collective advancement that will inspire new trends in our exchanges and thus affect the nature of our intentions in relationship situations as well as our management of them. Venus in Virgo’s quincunx to Eris Rx in Aries highlights an adjustment toward mindfulness based on conscientious, non-judgmental evaluation and a virtuous, moderate approach. The Moon will ingress Aries at 04:41 pm EDT, conjunct Uranus Rx and oppose the Mars-Saturn conjunction, which could feel stimulating and motivate us to start over in fresh spirit. 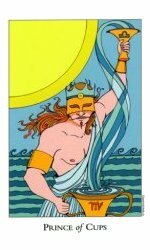 Tarot card of the day is “The Fool” with the message to act now without concern for the risks. 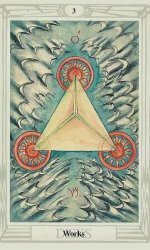 This card represents spontaneous action, unlimited potential and the start of a new journey. You are now ready for change. Seize the day and be prepared to take some risks in order to make big gains. You may embrace the future with great enthusiasm, because you are protected by your optimism and innocence. Lateral thinking is the Fool’s forte and therefore, you could come up with some surprising solutions to your problems. The journey begins now. In a project called the Robotic Tentacle Manipulator, engineers at the U.S. Army Research Laboratory are developing snake-like autonomous robots that can go into dangerous situations in place of live soldiers to aid in search and rescue missions and to inspect potential threats from Improvised Explosive Devices, or IEDs. That type of explosive has been a major source of headaches for the military in Iraq and Afghanistan, which at times has been responsible for half of U.S. military deaths in the region. Instead of sending soldiers into harm’s way to find and deactivate these explosives, snake robots would do the job. 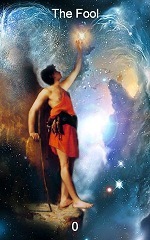 – In this case, they invented a technological device (Uranus), a snake-like autonomous robot (Eris) to be used on military missions (Aries, Jupiter in Aries), meant to inspect potential threats and thus ultimately to protect their soldiers (Jupiter-Pluto), that is a useful inspection tool (Mercury in Virgo in aspect to Jupiter-Pluto) and an improvement (Mercury and Venus in Virgo) that serves the interest of controlled activities (Mars-Saturn conjunction). Ceres Rx in Sagittarius receives a sesqui-quadrate from the Sun in Leo and a square from Venus in Virgo, which are testing our level of confidence and expertise in circumstances where our understanding of the bigger picture, skilled conceptualization and ability to recognize patterns are essential to a thorough approach of the situation. The quincunxes between Mars in Virgo and Chiron Rx in Aquarius and between Juno in Cancer and Neptune Rx in Aquarius indicate that awareness of processes at work, especially in regard to the human condition as well as in consideration of individual factors in this context, require a supportive attitude that is inspired by higher ideals and well-meant intentions in order to foster sympathy when we engage in causes and other interchanges. This motivational adjustment precedes Mars’ ingress into Libra at 07:46 pm EDT that begins a phase of asserting ourselves in a more balanced, even-tempered, poised and polished manner. Tarot card of the day is the “Prince of Cups”, signifying a time of transition and enhanced creative and artistic expression. Applied idealism stimulates outpourings of unconditional love, based on the purity of our intentions. Soul alchemy happens as the intellect transforms the emotions to create harmony. Arizona and Fremont are at the forefront of the movement by state and local governments to get tough with illegal immigrants (Mars-Chiron), rather than rely on the federal government’s efforts to address the problem (Sun-Venus-Ceres). But they are learning that simply passing a law is far from enough (Ceres Rx in Sagittarius). Arizona’s law was the most far-reaching in the country and therefore the most closely watched. But similar measures are in place in local communities across the country, with effects that supporters may not have foreseen (Juno-Neptune). In a special election last month in Freemont, Nebraska, voters approved an ordinance barring illegal immigrants from renting a home and requiring employers to verify the legal residency of anyone they hire (Mars-Chiron and Juno-Neptune). That ordinance was also supposed to go into effect Thursday. But it was suspended Tuesday in the latest step on a legal journey every bit as convoluted as the road to implementation in Arizona (Venus-Ceres). The tortured history of the ordinance has deeply divided the people of Fremont (Mars-Chiron). The legislatures in at least five states — Michigan, Minnesota, Pennsylvania, Rhode Island and South Carolina — are considering full statewide crackdowns modeled on the Arizona law, and lawmakers in at least 18 other states have said they are preparing similar bills (all aspects). Most of the new laws are more limited, applying restrictions like employment verification and requirements for drivers’ licenses (Venus-Ceres). That’s just at the state level. Hundreds of local communities have passed or are considering measures like Fremont’s (Sun-Ceres and Juno-Neptune). – From the point of law ‘illegal is illegal’, there’s no question about it. But where does the human factor enter the equation? 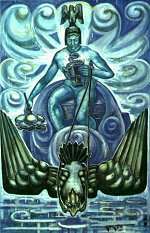 These radical measures will only increase the divide (Chiron) and add to the feelings of separation, while failing to address the problem from a level of understanding that is based on higher ideals and sensitivity to the human condition. The day began with Mercury in Virgo perfecting his quincunx to Uranus Rx in Aries and semi-sextile to Saturn in Libra, followed only shortly later by the Moon’s ingress into Pisces at 03:59 am EDT and her subsequent semi-sextile to Uranus and quincunx to Saturn. These are aspects of adjustment and complement, which required an instant adaptation to the energy shift. Therefore, choices and decisions we’ve made since then will reverberate throughout the day, affect our agenda and thus also how effectively we will follow up on our plans and make the best use of our time. Ready yourself to work in a constructive and productive way with these changes and shape them as you see fit by consciously merging with the flow of things until you find your own rhythm that will carry you on this current and inspire you to focus on your advancement. Tarot card of the day is the “3 of Pentacles”, suggesting the first stage of a project, cause or business has been achieved successfully and the people involved are making a commitment to the future. You must now consolidate your position or ready yourself for the next stage or series of challenges or move the relationship to the next level. It represents good fortune or preliminary success in the early stages of a business relationship. Efforts will show results in form of some stability; expertise and mastery have been achieved to some degree. Use your talents and pay attention to detail. The energy is oriented toward building and constructing to get the job done. Teamwork is emphasized as is coordinating with others, functioning as a unit, contributing to the group, cooperating and combining efforts, as well as containing and understanding wisdom. It was an early getup for me due to changes in J’s work schedule. Usually, I’m still very tired after such a short time of resting, but not this morning. The change worked for me, because it enabled me to write my blog before I have to dispose of the garbage and have to invest my energy into cleaning activities. So, this saves me time, which means I won’t fall behind too much and may even be able to concentrate on projects, where I need to make progress. However, the moment I was going to post this blog, the Internet connection failed and I haven’t been able to reboot my computer. In the meantime, my chores around the house are completed so far. Then I thought I should try J’s computer and was lucky. He still had the guest access there, and of course, his computer would work. Now that I accessed the Internet via his computer it worked on this computer as well. I have no idea why this is happening. Something here definitely needs to be reconfigured (Mercury-Uranus Rx-Saturn). Astro-Notes on July 27, 2010 – what’s your game? Prior to his Virgo ingress at 05:42 pm EDT opposes Mercury in Leo Chiron Rx in Aquarius, thus confronting us with a sensitive theme we should be conscious of as well as attentive toward while focusing on our agenda, or in other words, to integrate emotional and social intelligence into our plans. Mercury’s transit through his home sign corresponds to a phase of utilizing and improving our discerning and discriminating abilities when we analyze and judge a situation. Tarot card of the day is the “Prince of Cups”, also known as ‘the transformation’, who governs wishes and desires, which must be recognized as simply the compelling energy of our life to be mastered. Suggested is a focusing on creative, artistic ability. There is enthusiasm and openness to new ideas as well as passion and intensity. High ideals prevail. We may find ourselves on a quest for enlightenment by following our deepest heart and letting our soul guide us. In secrecy and silence, we could be searching for powerful truths and wisdom. Oil giant BP said it plans to offset the entire cost of its Gulf of Mexico oil spill against its tax bill, reducing future contributions to U.S. tax coffers by almost $10 billion. BP took a pretax provision of $32.2 billion in its accounts for the period, for the cost of capping the well, cleaning up the spill, compensating victims and paying government fines. However, the net impact on BP’s bottom line will only be $22 billion, with the company recording a $10 billion tax credit, most of which will be borne by the U.S. taxpayer, a spokesman said. BP’s U.K. tax bill will also be reduced, BP added. Analysts told Reuters that BP could prompt more public and political anger in the United States by deducting all the costs, and especially the expected fines BP will face. – This example shows total disregard for others’ feelings and losses to serve their selfish ends. For BP it’s just a tax write off, whereas for the folks in the U.S. it comes as another insult (assault as their President put it) and would also mean to lose even more revenue. Mercury in Leo forms a semi-sextile with Mars in Virgo and an opposition with Neptune Rx in Aquarius, while Mars in Virgo casts a quincunx to the latter as they configure an asymmetrical triangle that shows an impingement of the unknown, thereby bringing new angles into a situation, previously unforeseen or accounted for, demanding a reality check. Therefore, we need to think creatively with the focus on personal efficiency and Self-improvement, reconnect with our vision and clarify our intentions to clear the way and realign with our higher ideals. The Leo Sun’s quincunx to Pluto Rx in Capricorn and trine to Jupiter Rx in Aries call for self-affirmative action by confidently handling the situation, taking charge and staying our course with the aim to fulfill our objectives, based on evolved perspectives. A heightened, empowered sense of Self is crucial to the success of our mission as the emphasis is on reorientation – inner as well as outer – in order to initiate progress – individually as well as collectively – through civilized, sophisticated conduct and fairly regulated interchanges. 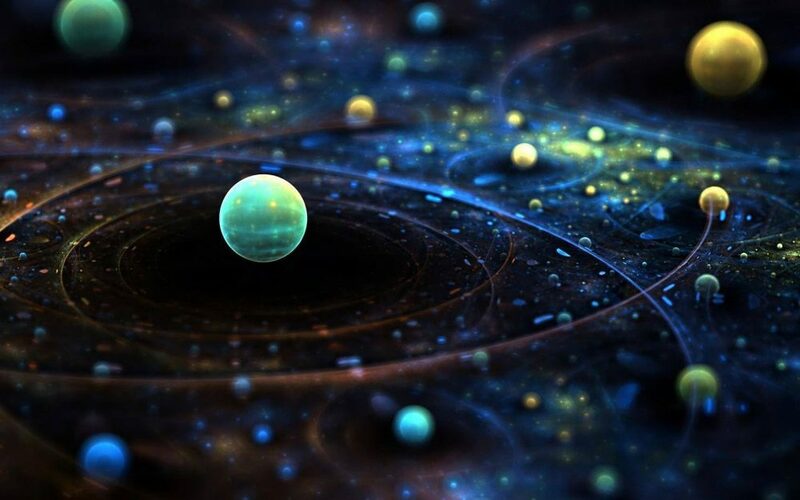 The final of a series of five oppositions between Saturn and Uranus today has shifted from the mutable to the cardinal mode and thus from adapting and reshaping to introducing and ushering in. It’s time to enact the changes we stand for. 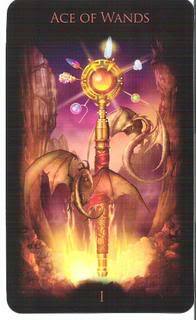 Tarot card of the day is the “3 of Wands”, suggesting a creative blending of energy and is sometimes called “the Lord of Virtue” as it is associated with our genuine identification with our inner needs and aspirations. Symbolizing a point of inner balance, where we are clear about the things we want to create in our lives and confident in our ability to make our dreams come true, it bestows a new quality of self-reliance and contentment. It represents the movement of ideas from the initial conception of the Ace and the planning stage of the Two to the point where action is now beginning to take place. The ground has been prepared and the overall feeling is ‘what’s next?’ Cooperation from others is available or they might be willing to help you make things happen. The Army Corps of Engineers has been enlisted to assist flood victims in eastern Iowa in the U.S. – Here we have a case of an evolved perspective, leading to a better coordinated and specified take on the situation, derived from experience with previous natural disasters. Action is informed by need and efficiency and oriented toward repairing and damage control (Mercury-Mars-Neptune; Neptune symbolizes the flooding). The waxing square between Jupiter Rx in Aries and Pluto Rx in Capricorn perfected today together with Mercury in Leo’s sesqui-quadrate to the North Node in Capricorn. Consequently, we could’ve experienced the pressure related to this crisis in management, of struggling to remain in control over set-backing influences, restricting conditions and limiting circumstances, testing our strength, will and power, intensifying. We know that we need to get ahead and in the same token we understand that we also need to cut us some slack to be able to replenish our resources – physically and mentally. Therefore, we may want to consider our obligations and goals from a self-responsible perspective and reorganize our priorities accordingly. Thus, we might be feeling relieved and liberated, grabbing for change and excitement, after the Moon’s ingress into Aquarius at 03:37 pm EDT. Our individual choices in this regard will bring us immediate results, thereby offering a chance to revitalize and rebalance with the Moon’s instant sextile to Uranus Rx in Aries and trine to Saturn in Libra. 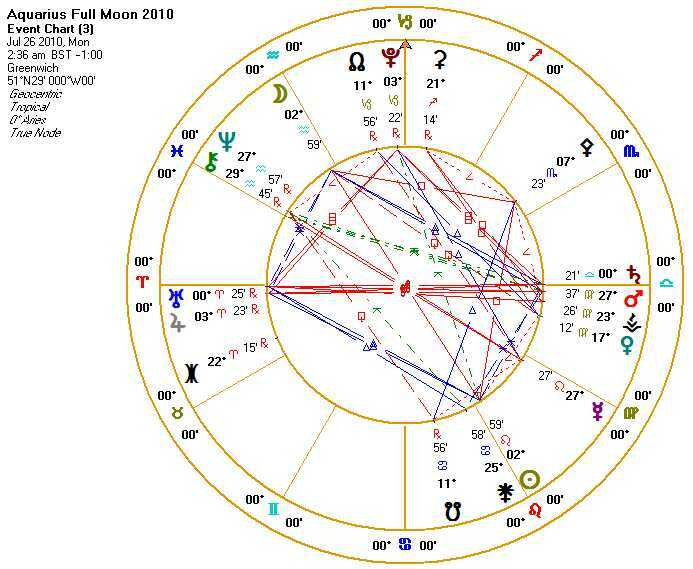 These developments lead us into the peak of the Cancer lunation cycle that will transpire at 09:36 pm EDT in the Aquarius Full Moon, a time when success and failure of initiatives begun in sync with the seed impulse are highlighted. Implied by these symbolical pictures is a redefining of our sense of Self, based on a refusal to be bound by or live up to rules and standards, which are irreconcilable with our Self-interests and the new trend we initiated. In the context of the message that sounded forth at the time of the Solar Eclipse/Cancer New Moon we are now confronted by a moral choice that involves the manner in which we seek to express our personal rebellion at this stage of our individuating process, whereby we can either opt for progress and thus individual evolving and contributing to the elevation of group conciousness, or regress and adopt an anarchistic attitude. 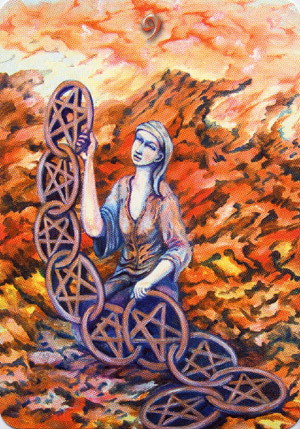 Tarot card of the day is a double: “Ace of Wands covered by the Nine of Pentacles”. 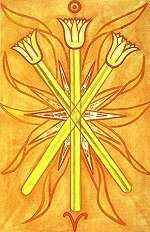 The Ace of Wands suggests a new beginning, a creative, dynamic energy and a spark of inspiration, which allows you to create a whole new plan for the future. The focus is on the potential of new ideas that are forming. You realize that you may have several options to consider, all of which look promising. It relates to exciting new directions in your working life, which may come from within in the shape of brilliant, intuitive ideas, or from outside, in the form of a challenging new project. Fruitful innovation is signalled, but success and satisfaction will only come after taking on a challenge or challenges that involve taking risks. Personal contentment will be the result of taking a chance, which requires the application of foresight, good planning and being prepared. Self-sufficiency is indicated as is a strong feeling of sustenance, material comfort and solid, sensual pleasure. A project will bring happiness and a sense of serenity as a consequence. The 9 of Pentacles represents all that is most gracious, high-minded and civilized and can also be a sign of discipline and self-control. So, basically, the new beginning or new direction (new trend) promised by the Ace of Wands will lead to success if we let us be guided by high-mindedness and civilized behavior, implicated by the 9 of Pentacles as the covering card. As it was to be expected, we came home late from our shopping spray and were both quite exhausted. However, the story of course didn’t end there – I had to unpack and store away the groceries, while at the same time I quickly prepared something to eat for my daughter, who still had another one-hour drive home. She wouldn’t stay overnight, because her dog was alone. My rabbit wasn’t happy either that I haven’t been there for her in the evening. J couldn’t wait to go to bed to make sure he’d get enough sleep in order to be able to drive all the way to his mom’s place. Anyway, once I was done in the kitchen, had fed and soothed the rabbit, I was too tired to empty my bags and remove the price tags from the clothes – just let everything sit on the couch and then fell into my bed. The early getup this morning didn’t help me feeling better. So, I just cleaned up and finally stored away my stuff and then went back to bed. I could’ve slept all day long, but I got up around noon to do the laundry and write a short blog about the Full Moon event. In the afternoon I sat outside – it was the first time this week that we had nice summer weather. I couldn’t focus on the book though; I clearly needed this day of simple relaxing to replenish my resources.